Are We Doomed to Get Rashes from Our Fitness Trackers? Constant 24/7 fitness tracking can have itchy, scratchy consequences. 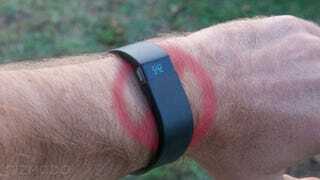 Those would be wrist rashes, as Fitbit users have been learning. But rashes aren't just a Fitbit problem—any wristband can leave you red, thanks to some basic biology. There may be no miracle cure for this malady of the quantified self. Our skin has the thankless job of protecting our squishy insides from every liquid, solid, and gas out there. And skin can be fickle. It can be sensitive. Skin does not like being clenched by a bulky piece of plastic or metal 24 hours a day—whether that's a Fitbit or a waterproof smartwatch or even a ring. There are a number of reasons wearing a fitness tracker can cause your skin to revolt, and obviously, everyone's skin is a little different. "The term 'rash' is nebulous," says Dr. Ella Toombs, a dermatologist in Washington, D.C. So let's apply some more precise terms to how you get rashes—and how to avoid them. Last year, Fitbit was forced to recall all Force wristbands because they had, well, a nasty habit of making skin itch and burn. Afterwards, the company admitted it had messed up by using materials that are commonly allergenic. The main culprit was likely methacrylate, a chemical in the Force's adhesive that is also found in everything from bone cement to cosmetics. Unfortunately, some people are also allergic to it. Another culprit could be the nickel used to make stainless steel. Nickel allergies are exceedingly common—the Centers for Disease Control estimates 10 to 20 percent of the population is allergic—and nickel shows up in alloys for jewelry, clothing, and so. The nickel in stainless steel is tightly bound in a crystal lattice, so it usually doesn't cause nickel sensitivities. But it's still not completely nickel-free, and it can still cause problems in a small number of people. Fitbit told me that their new line of new fitness trackers replaces the methacrylate-containing adhesive with screws, and reduces the amount of stainless steel that comes in contact with the skin. That's likely to reduce the number of allergic reactions, but it's not going to stop all rashes. Allergies are one thing, but irritants are another. Irritant contact dermatitis doesn't require a specific allergy to a substance. Some substances are simply irritants to the skin. A very common example? Soap. Soap can get trapped under a band if you wear it in the shower or while doing the dishes. After a while, the harsh chemicals—which are fine for momentarily contact—begin irritating the skin. Your skin cells begin to mount an immune response against the chemicals, leading to the redness, swelling, and itchiness. It's not just fitness trackers that have this problem, of course. So-called "wedding ring rash" is the result of irritant contact dermatitis. Miliaria, also known as "prickly heat" or "heat rash," is another possibility suggested by Dr. Cameron Rokhsar, a dermatologist in New York. Here, the sweat ducts are literally blocked by a band tightly pressing against the skin. You may have experienced miliaria on a larger scale during a humid summer day: it's an itchy red rash that goes away after a while. The manufacturers have a part to play. Like Fitbit, which learned its lesson during the messy Fitbit Force recall. Avoiding allergenic material and choosing soft but durable plastics will prevent bands from irritating the skin too much. And then there are simple design decisions like Basis's SportVent straps, which have a perforated grid to improve breathability. For users, it's just a matter of giving your wrists a rest. Switch between wrists. Take it off in the shower. Wash it with soap-free cleanser. Brent Rose, our intrepid fitness correspondent who has has tried a truly absurd number of trackers, notes that he's gotten a rash from nearly every smartwatch and fitness tracker he's tested. Brent says he's been more careful lately about switching wrists and keeping his Charge HR clean, and rashes are no longer a big problem for him. Everyone's skin is unique, of course. Some of us can wear scratchy sweaters and eschew sunscreen with impunity. The more unfortunate have to scrutinize the label on every item of clothing. But wearing a piece of plastic tightly around the wrist all the time is kind of unnatural. Why not let a few heart beats go unmonitored? Your wrists may thank you.